Developed to assist marine policymakers to achieve or maintain GES (Good Environmental Status) of coastal and marine ecosystems in the Mediterranean and Black Sea basins. It is aimed at policymakers who are developing marine environment policies, including decision-makers at local, national, and regional authorities. How can a Good Environmental Status (GES) be achieved? How can it be maintained? Where can data and resources on the environmental status of the South European Seas be found? What does a good approach to the design and implementation of marine policies entail? The Adaptive Marine Policy (AMP) toolbox has been developed as part of the PERSEUS project. The AMP has been devised as a measure to support policymakers in the design and implementation of maritime policies related to the achievement or maintenance of Good Environmental Status (GES) of coastal and marine ecosystems in the Mediterranean and Black Sea basins. It is chiefly directed at people involved in decision making and aims to provide easy access to scientific findings and resources, but the toolbox can also serve the needs of users that have an interest in marine policy and wish to extend their knowledge. On a more general level the AMP toolbox has the purpose of addressing the lack of coherence in existing methods for the support of policy making as regards the GES of European Seas. The AMP was collaboratively developed by marine scientists and socio-economists, so as to ensure that a multi-disciplinary perspective is applied to marine policy management in the context of MSFD. To gather case study material (best practices). Step 1 (Set the scene): The initial stage of the policy cycle provides the basic information necessary for the definition of the baseline state of affairs, including: (1) ecological, economic and social analysis, and (2) analysis of the existing institutional, political and legal framework in marine affairs. This knowledge is then used for the definition of the policy goals and the identification of potential risks. Key activities include: (1) involving experts and stakeholders; (2) gathering information and determining existing conditions; (3) developing a mutual understanding and defining principles and goals; (4) developing scenarios and performing risk analysis. Step 2 (Assemble the basic policy): In this step the policymaker is guided through the process of defining the possible policy solutions to deal with the issues identified in Step 1. The second step includes both a process of policy identification and analysis, and an engagement of all stakeholders, so as to generate a wider variety of ideas and to increase the legitimacy of the policymaking process. Key activities include: (1) identifying measures; (2) assessing and prioritising new methods, and (3) involving experts and stakeholders. 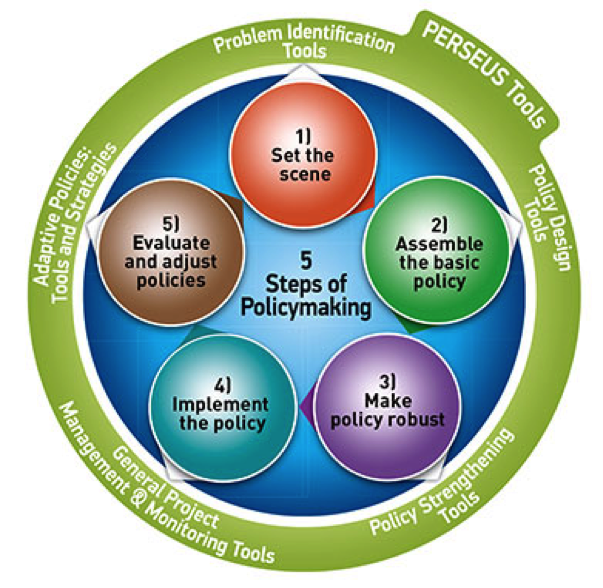 Step 3 (Make policy robust): This step builds on the achievements of steps 1 and 2, in that it deals with the configuration of coherent policies, using the identified alternative measures and considering the results from the risk assessment. Step 3 incorporates measures for the development of forecasts and the definition of indicators to monitor progress in the achievement of the identified objectives. As this step includes the introduction of adjustments to the policy, it may entail a series of iterations of steps 1 to 3. Key activities include: (1) checking conditions warranting the use of adaptive management; (2) involving experts and stakeholders; (3) forward looking analysis: assess policy success – and risk factors; (4) assessing and prioritising new measures; (5) designing and implementing a monitoring plan. Step 4 (Implement the policy): This step entails putting the adjusted policy plans into action and revolves around the management of policy implementation. The efficiency of the activities under Step 4 depends to a large extent on the quality of output from the previous steps of the policy cycle, but also on external factors, which are not always susceptible to control. Taking this into account, the step includes guidance with regard to the monitoring tools, which set triggers for policy adjustment, where required. Key activities include: (1) drawing up an implementation plan; (2) involving experts and stakeholders; (3) designing and implementing a monitoring plan. Step 5 (Evaluate and adjust policies): This step represents the final stage of the policy cycle and provides a link to a potential new cycle. It is based on the evaluation of achieved progress and is used to measure the gap between the Good Environmental Status and the achieved state of the environment. The assessment procedure should identify measures for the improvement of the achieved results by adjusting to the newly emerged issues. Apart from the environmental status, this stage should also provide an analysis of other parameters, such as socio-economic impacts, costs, benefits and sustainability, as well as policy acceptance by stakeholders, side effects and all key factors affecting policy performances, as identified in Step 3. Key activities include: (1) evaluate the on-going policy, and (2) adjust to new uprising issues. The main output of the AMP is its one-stop repository of principles, methods and resources to elaborate marine policies in the Mediterranean and Black Seas. This is coupled with a guide to provide the users with assistance in the use of the toolbox. A shortlist of examples that are particularly relevant to the Mediterranean and Black Seas will be used as a knowledge transfer tool to disseminate good practices. The AMP toolbox is fully applicable in other contexts, as it represents a theoretical policy cycle model, which is independent from local and thematic specificities. It can be applied both to the process of marine policymaking in other regions and to different policy fields altogether. The approach it offers is very flexible and can be easily adapted to different contexts. The AMP toolbox can be applied to projects in other settings as long as there is a project implementation team with clear roles and functions and this team follows the guidance for each of the steps strictly. Direct costs of this practice elaboration are unknown.